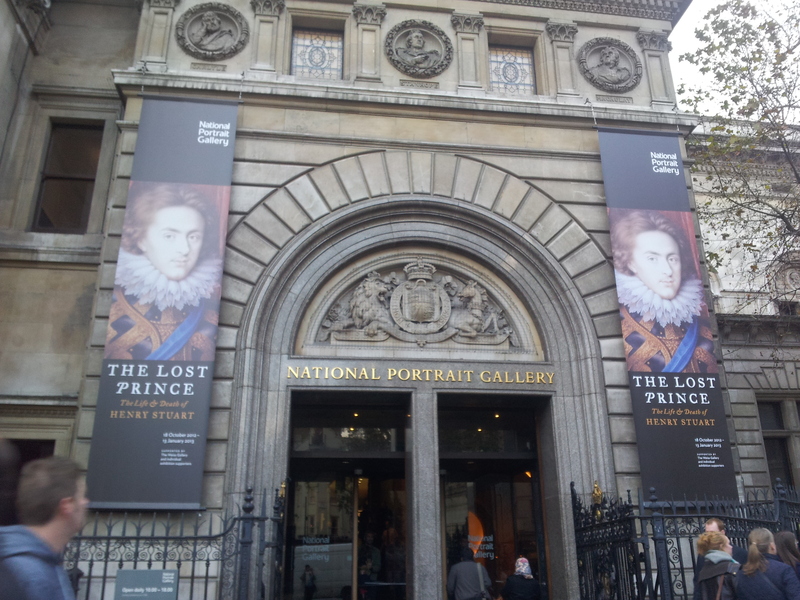 I visited the National Portrait Gallery yesterday to attend the “The Lost Prince – The Life & Death of Henry Stuart.” For those who plan on visiting, please do, but perhaps you shouldn’t read more below, as I’ve written this mainly for people who live abroad and will not be able to go to the exhibition. I was carrying a few things in my bag since I had been assisting at Kensington Palace earlier that day and so I needed to use the cloakroom/locker room for the first time – which was very handy as it left me free to just hold my notebook and pencil (always take pencil when you go to a museum or do research, pens are a no-no). NPG charges £1 to use the lockers and that is non-refundable, so make sure you sort everything out before you lock up. After collecting my ticket from the desk, as I had purchased it online, I went to the exhibition, where I showed my ticket to a very pleasant young lady at the entrance. There were more people in the exhibit than I had thought there would be, which was a nice surprise. Let me tell you straight off that the exhibition as a whole was very tastefully done. To add to the ambience, there was some Early Baroque/Late Renaissance choral music played, which got louder as you went further into the exhibit- lovely touch! The first room has portraits of Henry as a little boy, his father, James I, and his mother, Anne of Denmark, along with portraits of his siblings Elizabeth of Bohemia and Charles, then Duke of York (later King Charles I). The painting of Queen Anne was by John de Critz the Elder and had never been displayed to the public, as it was was only recently discovered. 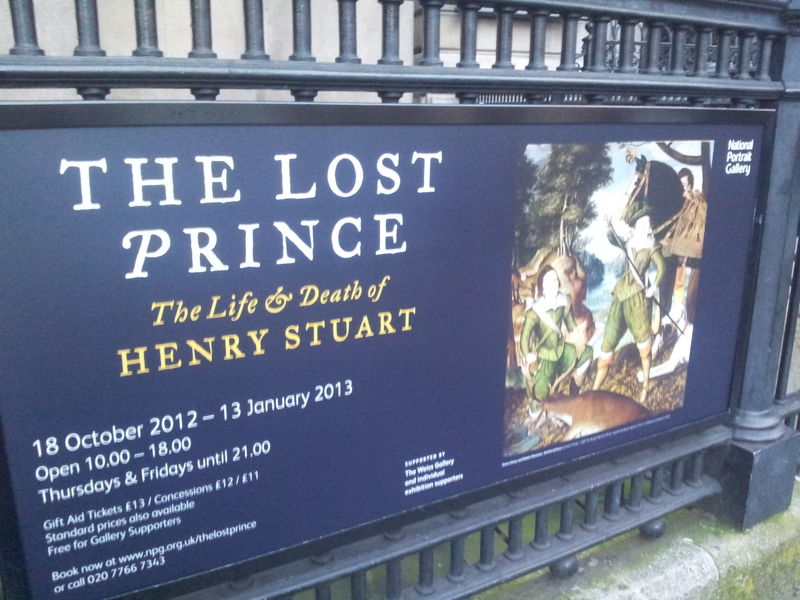 That in itself is worth going to this exhibit. Britain, behold here portray’d to thy sight Henry, thy best hope, and the world’s delight; ordain’d to make thy eight Henries nine. On the wall adjacent to the Queen Anne painting is a lovely painting of the young Princess Elizabeth, the only surviving daughter of James and Anne. Elizabeth would later marry Frederick V, Elector Palatine, and she would one day be known as The Winter Queen. Henry, born in Stirling Castle, Scotland in 1594, was a great prince, exceptionally learned, cultured, dashingly handsome and excelled at manly pursuits such as the military arts and athletics. As a result, he was deemed an ideal prince, for he had so many virtues. Referring to his education, a large smile crept across my face when I looked at some of his scribblings in his notebook and when I saw the books that were in his collection, such as Tycho Brahe’s Astronomiae Instaurate Mechanica from 1602. National Portrait Gallery advert. Photo: Andrea Zuvich. There were several surprising paintings, many of which were on loan from Her Majesty Queen Elizabeth II, which depicted young Henry in dynamic poses by Robert Peake. In one he is clad in green, with an alert, intelligent visage while he seems to be drawing his sword. As dead stag is at his feet, a greyhound lounging, and noble horse are behind him. Obviously he had been on the hunt. Henry was instrumental in the marriage of his sister Elizabeth and Frederick V (who had several children including Prince Rupert of the Rhine) and he also communicated regularly with many of Europe’s more enlightened rulers. He loathed swearing, much like his grand-nephew William III would. He took part in court Masques, and there were costume sketches by Inigo Jones and two of Henry’s suits of armour were on display. There were also several miniatures, some by the famous Nicholas Hilliard – such a wonderful talent he had! Henry had the makings of an extraordinary king and every preparation had been made for him to become this. But, in 1612, a foul year for many people in the Seventeenth century, Henry suddenly became ill with a terrible fever. His many physicians attended to him, but none of their primitive forms of help could save him. His last words were, according to some, “Where is my dear sister?” and he died at 2 in the morning on the 6th of November. He was only eighteen years old. After analysing the documentation of Henry’s autopsy, physicians centuries later concluded the disease must have been Typhoid fever. Typhoid killed many important historical people, most notably Queen Victoria’s beloved Prince consort, Albert of Saxe-Coburg-Gotha. Henry is dead, Henry is dead! King James, swamped in grief, apparently said those words often in meetings after his son’s death. Queen Anne shut herself away in her room and mourned deeply. What an unexpected tragedy – everyone had such hopes for him; that he would be one of the greatest kings of England, and then to be struck down so young – how terrible! Charles had grown up in the shadow of his “perfect” brother and became heir to the throne as a result of his brother’s death. Imagine how daunting it would have been for him to suddenly be thrust into such a role. As I sat there gazing around at the paintings, I wondered: Could this have triggered a feeling of inadequacy in young Charles – which in turn perhaps caused his terrible character flaws? But, would it really have been different? Both boys were indoctrinated to believe in the divine right of kings, but Charles was weaker and heavily influenced by his wife Henrietta Maria. Perhaps Henry, who made strong and intelligent decisions in his short life could have avoided the whole circumstance than eventually led to his brother’s execution. Should we then imagine that, had Henry lived, there might not have been the Civil War? We know not, thought it’s tempting to speculate. 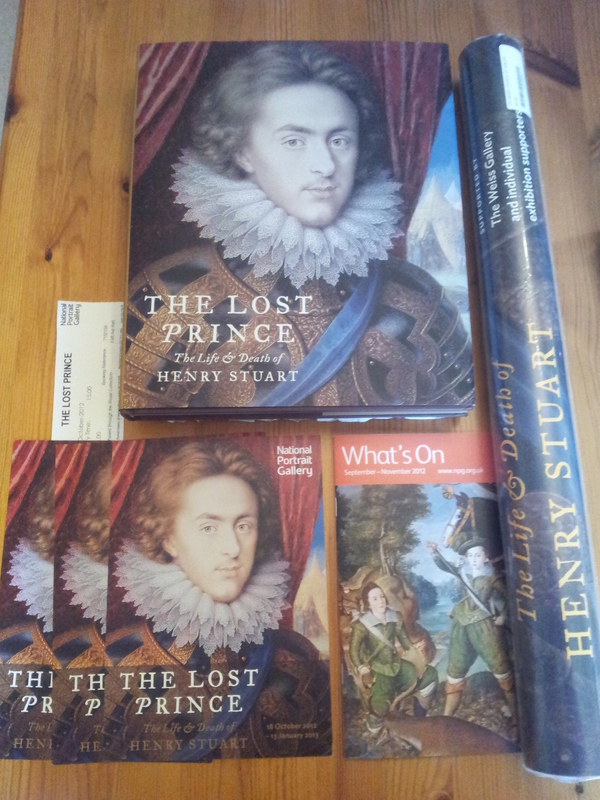 I left feeling a great sense of melancholy, of loss, as anyone would, surely, when a life is cut short; and I shed a few tears at the thought that things could have been so different, that potentially the Stuart succession would have been assured then, with Henry’s line. If he had lived, I believe that we would undoubtedly have had a vastly different royal history. Merchandise from NPG. Photo: Andrea Zuvich. Our Rising Sun is set ere scarce he had shone, and…all our glory lies buried. it strikes me quite a few Kings have been thrust into that role when they weren’t originally intended to be – Henry VIII, Queen Mary, Charles I, James II, King George VI. Plus others I can’t remember. There’s probably a book in there for somebody. Hi Sam, I agree, there have been several who have been in a similar circumstance. It’s quite an interesting thing to ponder over. And someone is bound to write a book about that someday (maybe you?). A 17th Century Ode to Cleopatra of Egypt → ← Welcome to the new blog!